For a while now I have been toying with the idea of building a true race car, rather than just a track day car. I made steps towards this goal over a year ago when I picked up a ’94 325i chassis which had already been caged by BimmerWorld. Over the past year I had accumulated quite a few parts for this car. 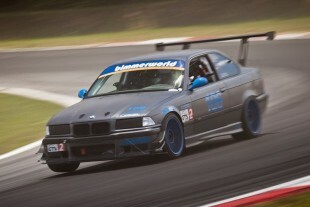 The car was intended to be a GTS-2/3 or BMW Club Racing C-Mod car. I would have been happy to run it in I-Prepared or another lower class, but the cage design passed through the firewall and was welded to the A & B pillars. It also had a Tilton three cylinder hanging pedal setup. These mods alone bumped it up to Mod class with CCA Club Racing. After a lot of debating, I decided I wanted to go another route. The Mod class and GTS series would mean nearly open rules, which mean things like big brakes, large sticky R-comps, and full aerodynamic aides in addition to having a great suspension. You can probably imagine how the costs can and will escalate going this route. So with a bit of reservations I put my chassis, parts, and engine up for sale. I also decided to part ways with my first true project car, the 2002 Toyota MR2 Spyder. That was quite a bit tougher to bear, but I couldn’t see myself getting full use out of the car. Starting over I decided I needed to go a more cost-controlled route, something where the playing field is closer and is more about close racing. Generally this is the realm of spec racing. There are a few series out there, the largest and most established are Spec Miata and SpecE30. Both are some of the least expensive racing, using older and smaller cars that are fairly easy to come by and pretty inexpensive to run. 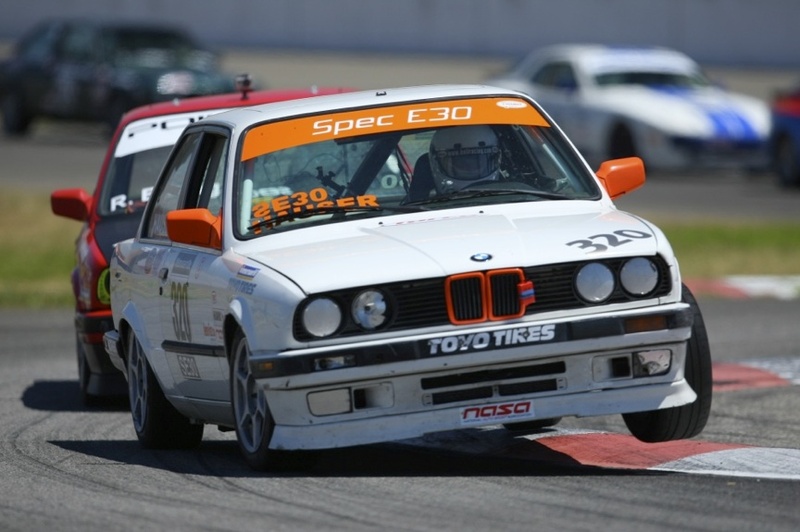 There is also SpecE36, Spec3, and SpecZ, none of which have really taken off compared to the E30 and Miata classes. I was more interested in staying in the BMW family, as I was becoming more and more familiar with them through the work on my E36M3 and M Coupe (and taking apart a ’95 M3.) So I was focusing on the SE30 class, which runs with NASA using the 325i chassis E30 from the mid 80s to early 90s. There were a few complete cars available in the $12-15k range, but none in my area and not many that were exactly what I was looking for. Besides, I like the build and work as much as running the car. Since these cars are getting up in age, finding suitable chassis donors and powertrains is becoming more and more difficult. I must also admit that I am much more familiar with cars from the late ’90s and early ’00s, having wrenched on cars mostly from that era. I also wanted a few of the newer innovations that only later cars have, such as CAN bus communication to allow for more in-depth logging capabilities. This led me to the rather new Spec E46 racing class, which was imagined in 2013, then developed over the 2014 racing season. Spec E46, or SE46 for short, uses the 2001-06 BMW 330Ci coupe or 330i sedan as its basis. These were fairly basic cars, but still plenty capable with some upgrades. The idea behind any spec series is to somewhat contain the costs while matching the car capabilities as closely as possible, providing more of a driver’s series. There are no aerodynamic aides allowed, no internal engine modifications, no huge rubber or big brakes. That said, the founders of the series consulted with folks like James Clay of BimmerWorld to put together a very fast package. Things like MCS shocks, LSD differentials, and a 2,850lbs minimum weight make for a quick car. I began following the development of the class about a year ago, watching their forum and Facebook page to see how things panned out. Any racing is a big investment, and it can be a gamble to test a new class. No one wants to race in a class with only a handful of cars. But things were actually taking off quite rapidly. Lots of new builds were beginning every week, and the racing that was going on looked to be highly competitive. 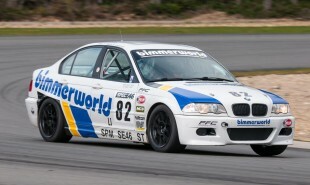 SE46 had the backing of BimmerWorld along with several other industry names, and was quickly adopted by NASA as a national class. 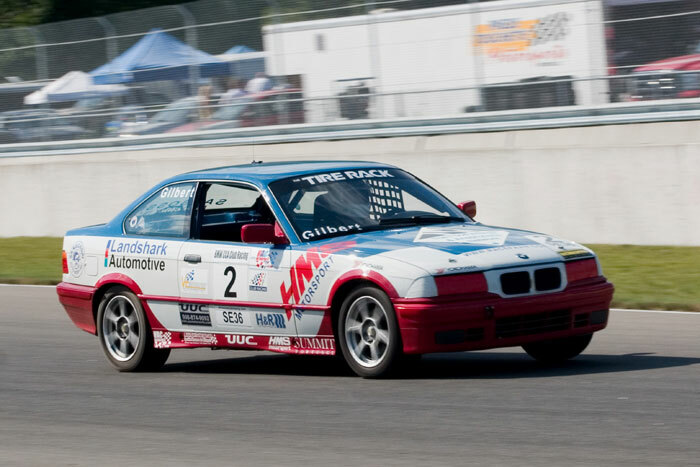 Not long after it was also picked up by BMW CCA Club Racing and the SCCA. Having multiple organizations to run with made the prospect that much more sweeter. I decided to bite the bullet, sold my GTS E36 project, and started looking for a 330Ci donor. 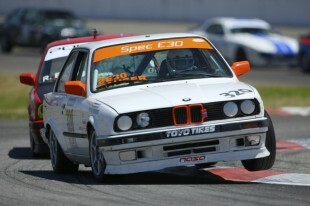 SpecE46 is open to model year 2001 to 2005 USDM BMW 330i sedans and 2001 to 2006 330ci coupes. No ZHP, 330xi, or convertibles are permitted. Tires are Toyo RR (Dry) and RA1 (Wet) in size 235/40/17. Minimum vehicle weight 2850# with driver.